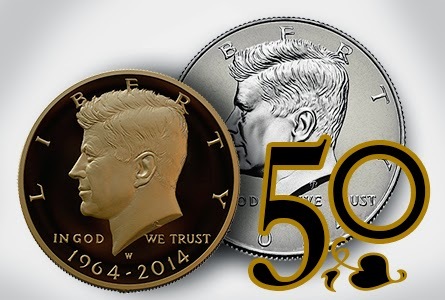 In August the U.S. Mint will be offering 50th anniversary Kennedy half dollars. Given the recent debacles at the Mint, it will be interesting to see whether there are many orders and how well the mint handles them. There will be three sets available: a four coin .900 set (one from each mint), a two coin clad set Philadelphia and Denver, and a 3/4 ounce .999 gold version. I had decided to swear off buying anything from the Mint, but I will have to make an exception for this. I will buy the four coin set as I think that will be the most important to collectors. I'll ignore the clad and the gold. Unfortunately, the four coin set apparently will be offered in four different finishes, a ploy to increase sales. I don't like reverse proofs, but that will be one of the coins, so if I want the others, that comes with them. That leaves the issue of orders. If you are a collector, you would have a better chance of getting at least one of the issue. If you want to take a chance to get more, hold off and wait. Dealers would still hire people to buy these coins, but they'd have to decide whether to get fewer right away or take a chance on being able to order later. Whatever their decision, collectors would have a better chance of getting their coins. I totally agree with your comments on the Kennedy coins. I am going to try and buy the four coin set also. I agree with your comments on how the mint should sell the coins also. Good luck to us all on this one.